The sure-fire method to find occupations in small cities is to head for the center of town. 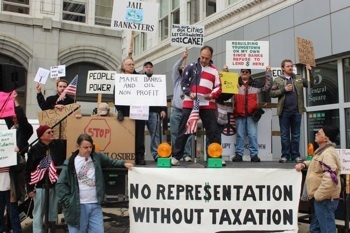 After leaving Philadelphia on our Occupy America tour, we drive an hour north to Allentown. Pennsylvania’s third-largest city at 118,000 residents, Allentown has been weathered by years of deindustrialization in the steel, cement and textile industries that once made it an economic powerhouse. In the outlying neighborhoods, tidy but weary row houses line MacArthur Boulevard, one of Allentown’s main drags. Close to Center Square, site of the requisite Civil War monument, the neighborhoods are heavily Latino, and buildings exhibit signs of disrepair. Occupy Allentown has taken up residence in Center Square, inhabiting one of the red-brick plazas on each corner. There are a handful of tents, a well-supplied kitchen pavilion and an information desk. A large blue and gray nylon tent, into which 12 people crammed the first night of the occupation, has laundry hanging on a clothesline in back and a cardboard sign on the front that reads “Zuccotti Arms,” a reference to the original Wall Street occupation. We’ve come in search of Adam Santo, said to be the local leader of a leaderless movement. But that was not his intention. A handsome youth a few years out of college, Santo says he knew about the planning for Occupy Wall Street prior to Sept. 17. Santo says when Occupy Wall Street “really took off I thought, I’m going to make this take off in the Lehigh Valley, gather support, get people into the streets.” Santo set up a Facebook page on Sept. 30, the day before the 700 arrests on the Brooklyn Bridge and “harassed my friends to join.” Next, he designed, photocopied and handed out thousands of flyers to spread the word. I mention Asmaa Mahfouz, the woman who helped ignite Egypt’s uprising with powerful video blogs and by handing out thousands of flyers in the Cairene slums. He wasn’t familiar with her story but he does take Egypt’s revolution as inspiration. It’s one of those familiar enterprises of our time: socialism for the well-to-do. Allentown is using eminent domain to buy up businesses next to the encampment — including a Wells Fargo branch — that will be demolished to build an 8,500-seat arena for the Phantoms, a minor-league hockey team. The city has authorized borrowing up to $175 million to pay for the multi-use facility, while the Phantoms’ team owners are willing to throw in perhaps 10 percent of the cost. While anger is widespread over what is seen as shady political dealings for a taxpayer-funded stadium that will displace dozens of local businesses, many residents are more consumed with just trying to survive the grinding economic crisis. Allentown’s official poverty level in 2009 was 24 percent, twice the state average. In a departure from big-city occupations like New York City, beat cops are openly supportive, says Santo. “They drive by, they wave, they honk. They give us handshakes and hugs … because they realize they are part of the 99 percent.” Local clergy are encouraging their congregations to donate goods and “[supply] us with warm bodies, which we definitely need,” says Santo. At the same time, local conditions have limited the growth of the occupation. DeLor says many supporters have to juggle multiple part-time jobs, which limits the time they can spend protesting. During the week the number of campers and occupiers dwindles. This also may be why the day we were there, Oct. 18, the occupiers were mostly unemployed or retired. Youngstown, Ohio, is an elegiac city a few hundred miles to the west of Allentown. What was once the manufacturing district is a mausoleum of industry. A brick smokestack stands sentinel over acres of cavernous shells that once poured out streams of goods. Crumbling brick buildings sprout trees two stories up, while inside, pancakes of concrete dip toward the ground, suspended precariously on a bramble of rusted re-bar. Demolition is one of the few signs of economic life. Starting in 2006, the city tripled its budget for razing abandoned buildings. In an open-air yard in the industrial quarter, heavy machines whine and billow exhaust as they pound large concrete slabs, surrounded by small mountains of rubble sorted according to size. With more than 43 percent of the land vacant, Youngstown is slowly being erased. In some neighborhoods, boarded-up houses and empty lots island the remaining inhabited homes, which shrink behind spreading foliage lest they be next. Since 1950, the population has declined from a high of 218,000 to less than 67,000 today. The poverty rate is a stratospheric 32 percent, and the median value of owner-occupied homes is a paltry $52,900. Manufacturing dropped from 50 percent of the workforce in 1950 to 16 percent in 2007. This includes a staggering loss of 31 percent of manufacturing jobs in the region from 2000 to 2007 — before the economy fell off the cliff. At the downtown crossroads, Occupy Youngstown has taken up a position in the shadow of three different banks, including a Chase branch. The occupation is a latecomer, having started on Oct. 15 with a rally more than 400 strong at its peak, according to Chuck Kettering, Jr., an aspiring actor who has been laid off for a year from his previous position as a HVAC technician. His family is living proof of the toll of deindustrialization. In a phone interview, Chuck Kettering, Sr., calls himself “the poster boy for the rust belt.” A Youngstown native, he went to work in 1973 at age 19 and worked at two local U.S. Steel plants that shuttered: one in 1979, the other in 1982. Next, he landed a position with Packard Electronics in 1985 making electrical components for GM cars. After GM spun off Delphi in 1999, Packard was subsumed by the auto-parts maker. The company started moving jobs overseas. “Local operations were pressured by wages and most operations moved south of the border” because of NAFTA. Following Delphi’s bankruptcy in 2008, Kettering and some co-workers were given a one-time chance to work for GM itself and keep their wages, benefits and pensions. Now Kettering is on disability. His wife, hired by Packard in 1979, worked her way into management and was forced to retire after 30 years with a monthly pension that was slashed in half to $1,600 and with expectations of further cuts. Unlike the seven other occupations I have visited, Occupy Youngstown embraces electoral issues. Kettering and other occupiers wave signs and wear buttons opposing Issue 2, which would strip some 350,000 public-sector workers of collective bargaining rights. Karen Joseph, a soft-spoken 59-year-old mother of two whose family spends one third of its household income on health insurance, is by no means the only one who is against Issue 3, which would exempt Ohio from the incoming national healthcare law. This occupation comes with an expiration date. The city asked the occupiers to “take down the tents before business hours on Monday, Oct. 17, when the banks were opening,” according to Chuck Kettering, Jr. He says they complied, but Occupy Youngstown still maintains a 24-hour presence and has pledged to do so until Nov. 8, Election Day. In Toledo, Ohio, on the other hand, the occupation is struggling with living outdoors in a harsh climate because the city is making life difficult for them. Christopher Metchis, an energetic 19-year-old student who will be attending the Musicians Institute in Los Angeles next spring, explains that City Hall has denied them use of tents and generators and dispatched city crews to cut off their access to electricity. He has just spent the last two nights outdoors in a wind and rainstorm, huddling under tarps with a few hardy souls on a grass plaza in the downtown business district near the baseball stadium for the AAA Toledo Mud Hens. While we talk, a few people come by to help with consolidating supplies, folding tarps, stuffing blankets into a crib and kitchen work. A local pastor has also stopped by with words of support. Candice Milligan, a 30-year-old trans woman, says the living conditions make it “difficult for people who aren’t able-bodied.” She also admits that concrete support is not as forthcoming because much of the public does not know what Occupy Toledo is trying to accomplish. And they have to contend with a police force that is indifferent at best and a local media that is hostile at times. It has been a common sentiment on the trip so far. Americans in this part of the country are beaten down after decades of economic decline. Their prospects are limited. Civic embarrassment is more prevalent than pride. They lament the end of the “American Dream,” the notion that hard work and sacrifice would be rewarded with a comfortable retirement and a better life for their children and grandkids. But in the hundreds of occupations around the country they have found a space where they can speak of their struggles, burdens and aspirations. People listen and they hear similar stories, creating a genuine sense of community. They say it is giving them dignity. And perhaps most important, it is giving them hope. For regular updates and reports, visit occupyusatoday.com.